【Excellent Image and Video Quality】The reliability of high-performance 8-megapixel image resolution captures crisp, brightly colored photos each time motion is detected of wild game during the day (black and white at night), takes up to 9 photos per detection. The great video is at your fingertips, records clear video and sound (support 10s to 3 minutes video length). 【Low Glow Infrared Technology】 Equipped with 26 pcs black LEDs, takes wonderful images. Additionally, avoiding to produce such bright flash which scare animals away when taking pictures. 【User Friendly】In conjunction of wider view angle game camera, you can receive more surprise. Photo, Video, Photo + Video 3 modes with easy operation process. Detailed and useful user manual is included. Besides, Apeman service team provides professional 24-hour after-sales services on Amazon. 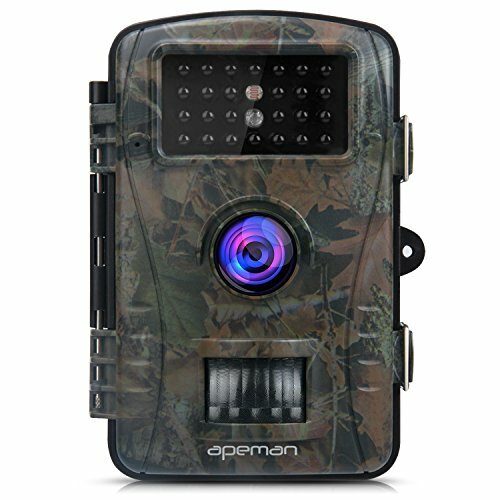 This hunting camera is designed to take photos and videos of wildlife, capturing every brilliant movement of them. Detect sudden changes to the ambient temperature of wildlife and get more fun. You also can use it as a surveillance system for home security. SD card and batteries are not included in the package. Please remove the protective foil from the camera lens for not affecting the camera effect.